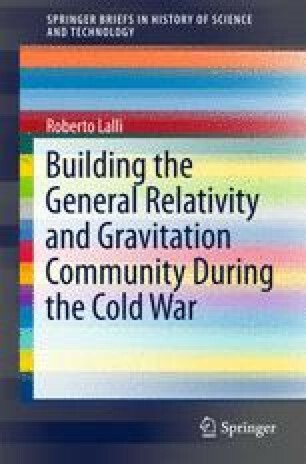 This chapter focuses on the period between the mid-1960s and the mid-1970s, regarded as the maturity phase of the “General Relativity and Gravitation” community. During this phase, many tensions of different kinds emerged and seriously jeopardized the existence of an institutional structure for promoting general relativity at the international level. These tensions ranged from cultural differences to generational struggles, from disciplinary rivalries to political conflicts. All of them became urgent matters of debate when the international conference held in the Soviet Union in September 1968 was dramatically affected by the recent military conflicts of the Six-Day War and of the armed invasion of Czechoslovakia. Under strained political circumstances, scientists attempted to draw a clear boundary between scientific and political matters. In the attempt to do so, the participants came to hold very different views about how these demarcations should be defined in the specific context of the activities of an international scientific institution during the Cold War. Despite the various conflicts, the institution was able to survive: this period ended with the transformation of the International Committee on General Relativity and Gravitation into the International Society on General Relativity and Gravitation—whose statute came to embody the political and other tensions characterizing its establishment. Anon. 1992. UIPPA-IUPAP 1922–1992. Album souvenir realized in Quebec by the Secretariat of IUPAP. http://iupap.org/wp-content/uploads/2013/04/history.pdf. Accessed 7 March 2016. Bergmann, Peter. 1963. Review of Gravitation: An introduction to current research, ed. Louis Witten. Science 140: 654. doi: 10.1126/science.140.3567.654-a. Bockris, J. O’M. 1991. The founding of the international society for electrochemistry. Electrochimica Acta 36: 1–4. doi: 10.1016/0013-4686(91)85171-3. Held, Alan, Heinrich Leutwyler, and Peter G. Bergmann. 1978. To André Mercier on the occasion of his retirement. General Relativity and Gravitation 9: 759–762. doi: 10.1007/BF00760862. Hoffmann, Dieter. 2013. Fifty years of physica status solidi in historical perspective. Physica Status Solidi (b) 250: 871–887. doi: 10.1002/pssb.201340126. Kilmister, Clive W. 1963. Review of Gravitation: An introduction to current research. Ed. Louis Witten. Planetary and Space Science 11: 997. doi: 10.1016/0032-0633(63)90130-2. Mercier, André. 1965. Report on the Second Texas Symposium on relativistic astrophysics. Bulletin on General Relativity and Gravitation 8: 1–12. doi: 10.1007/BF02938015. Mercier, André. 1967. Report on the Third Texas Symposium—1967. Bulletin on General Relativity and Gravitation 14: 1–10. doi: 10.1007/BF02938017. Mercier, André. 1979. Birth and Rôle of the GRG-organization and the cultivation of international relations among scientists in the field. In Albert Einstein: His influence on Physics, Philosophy and Politics, ed. Peter C. Aichelburg, and Roman U. Sexl, 177–188. Braunschweig: Vieweg. doi: 10.1007/978-3-322-91080-6_13. Peebles, Phillip James Edwin. 2017. Robert Dicke and the naissance of experimental gravity physics, 1957–1967. The European Physical Journal H 42: 177–259. doi: 10.1140/epjh/e2016-70034-0. Ruffini, Remo. 2010. Moments with Yakov Borisovich Zeldovich. In The Sun, the Stars, The Universe and General Relativity: International Conference in Honor of Ya.B. Zeldovich’s 95th Anniversary, AIP Conference Proceedings 1205: 1–10. doi: 10.1063/1.3382329.